Less Than 2 Miles from the South Gate! Ideally situated less than 2 miles from Yosemite's south entrance, this Fish Camp cabin will soon become a family favorite! This home is newly available as a vacation rental. It provides the quaintness of a cabin plus the modern amenities and comforts of home. It offers plenty of windows with gorgeous views of a meadow of ferns, tall Ponderosa pines and cedars. Relax in the large, open living room while you enjoy the warmth of the wood burning stove. The cabin's dining area opens to a wrap-around deck where you can cook on the gas grill or take in the views. The kitchen is well equipped with everything you'll need to cook your favorite meals. The master bedroom offers guests a comfortable Tempur-Pedic mattress and its own private bath. Kids will enjoy full-over-full bunk beds and their own DVD/TV. Outside you'll notice the seasonal creek and the giant boulder that was the inspiration for the cabin’s “Big Rock” name. The ground level deck provides a beautiful place to relax while the kids play and explore the ¾ acre lot. Privately tucked away at the end of the cul-de-sac, this cabin has parking for multiple cars and even a trailer. You will love the cabin's ideal Fish Camp location near Yosemite's Tenaya Lodge restaurants and spa. Very efficient and easy to communicate with. 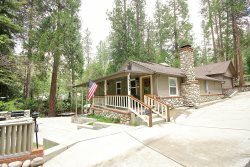 Great property in a fantastic location for exploring Yosemite (under 2 miles to camp gate!) The property was great and accommodated our party of 10 - having three bathrooms helped! Would definitely recommend to those planning on exploring Yosemite. We loved the outside decking area to sit on and grill at the end of a busy day and sit and watch the stars - such a peaceful spot!